The Illuminating 2016 project is a joint effort of a large team of faculty and students at Syracuse University. Jennifer Stromer-Galley (PhD Annenberg School for Communication, University of Pennsylvania) is an Professor in the School of Information Studies and Director for the Center for Computational and Data Sciences. She is an affiliated faculty member with the Department of Communication and Rhetorical Studies and with the Department of Political Science, and she is President of the Association of Internet Researchers. Jenny has been studying "social media" since before it was called social media, studying online interaction and influence in a variety of contexts, including political forums and online games. She has published over 40 journal articles, proceedings, and book chapters. Her award-winning book, Presidential Campaigning in the Internet Age (Oxford University Press), provides a history of presidential campaigns as they have adopted and adapted to digital communication technologies. She is currently a Fellow at the Tow Center for Digital Journalism at Columbia University. The Fellowship is helping to support a collaborative research project studying the 2016 presidential campaign by collecting and analyzing the candidates' and public's postings on social media. Mentoring the next generation of scholars and social entrepreneurs is something she particularly enjoys. An Assistant Professor at the School of Information Studies at Syracuse University. He is co-author of the bookGoing Viral (Polity Press, 2013 and winner of ASIS&T Best Science Books of 2014 Information award and selected by Choice magazine as an Outstanding Academic Title for 2014), which explains what virality is, how it works technologically and socially, and draws out the implications of this process for social change. You can see Jeff talk about researching viral events on YouTube. You can also see his Benefunder Profile. He is a founding member of the Behavior, Information, Technology and Society Laboratory (BITS lab) here at the Syracuse iSchool. Jeff earned his Ph.D. from the University of Washington's Information School, where he was a founding member of the Social Media Lab at the University of Washington. The lab received RAPID and INSPIRE awards from NSF, an Amazon Web Services in Education research grant award, and a gift from Microsoft Research. His research has appeared in journals like Policy & Internet, American Behavioral Scientist and the Journal of Organizational Computing and Electronic Commerce. Currently, Jeff teaches Information Visualization to amazing, dedicated and creative graduate students at the iSchool! You can find Jeff on Twitter @JeffHemsley, LinkedIn and Google Scholar. Bryan Semaan is an Assistant Professor in the School of Information Studies (iSchool) at Syracuse University (SU). Prior to joining the iSchool he was a Postdoc at the University of Hawaii at Manoa, where he collaborated with Dr. Scott Robertson in the Hawaii Human-Computer Interaction Lab (HI'CHI). He obtained his Ph.D. in Information and Computer Science from the University of California, Irvine, where he was advised by Dr. Gloria Mark. His primary research areas are in Human-Computer Interaction (HCI), Computer Supported Cooperative Work (CSCW), and Social Media/Social Computing. Bryan has been invited to contribute to several communities such as Computer-Human Interaction (CHI), Transactions on Human-Computer Interaction (TOCHI), Computer Supported Cooperative Work (CSCW), the Information Systems for Crisis Response and Management Conference (ISCRAM), and Digital Government Society (d.Go). He has been invited to serve on several panels and give talks on topics ranging from social media use in crisis to terrorism in the Internet age. He has also received awards for his work, having most recently received a SIGCHI Best Paper Award at the ACM CHI Conference--the premier conference on Human-Computer Interaction (More information is available here). Dr. McCracken is a Research Associate Professor who also teaches courses in the iSchool. Her general research interests are in applying the principles and tools of computational linguistics to making information accessible and understandable for people. Recent research projects includes an NSF funded project for using natural language processing and machine learning to assist social scientists in content analysis of text, an NSF funded project for building a qualitative data repository and a study of the language patterns of using Twitter to engage in politics. Dr. McCracken was formerly in the Center for Natural Language Processing where she was a project leader supervising research teams for government grants and business contracts. Past positions also include being a research scientist at the Northeast Parallel Architectures Center at Syracuse University, specializing in parallel computing languages, and as faculty in the School of Computer and Information Science at Syracuse University. Jennifer Grygiel is a social business professional who most recently served as the social business and emerging media manager and assistant vice president at State Street Corporation in Boston. There, she developed a social listening and marketing data and analytics program and was the lead project manager for the Social Intranet Project. She teaches social media at the Newhouse School. Yatish is a research staff at the CCDS (Center for Computational and Data Sciences). He plays a key role in the design and implementation of research projects at the CCDS and the iSchool. Yatish has many years of experience in the development of information retrieval, natural language processing, machine learning, content analysis and digital object repository applications. Previously, Yatish was associated with the CNLP (Center for Natural Language Processing) at the iSchool. His current interests include using NLP and Machine Learning techniques to solve data science problems and content analysis of social science data. Yatish holds masters degree in Information Management (Syracuse University, 2010) and under-graduate degree in Computer Science (R.V. College of Engineering, 2005). During his graduate studies at Syracuse, Yatish worked on multiple research projects at the Center for Natural Language Processing as a graduate research assistant. Before coming to Syracuse, Yatish worked for Alcatel-Lucent (previously, Lucent Technologies India R&D) as a software engineer. Patricia Rossini is a postdoctoral researcher at the School of Information Studies at Syracuse University, where she collaborates with Professor Stromer-Galley at the Center for Computational and Data Sciences. She holds a Ph.D. in Communication Studies from the Federal University of Minas Gerais, Brazil. Broadly speaking, Patricia is interested in studying the interplay between political communication and technologies. Her research focuses on online political talk, social networking sites, online campaigns, deliberation and political participation. Specifically, her dissertation was aimed at understanding how different discussion platforms such as social networking sites and news websites enable, constrain or shape the ways people discuss political news online, with emphasis on intolerant and uncivil discourse. Sikana is a doctoral student in the School of Information Studies at Syracuse University. She received her M.Eng. and B.Eng. in Computer Engineering from King Mongkut’s University of Technology Thonburi (KMUTT), Thailand in 2013 and 2011. Her research interests center around the integration of computational methods and social science. Her current research applies Natural Language Processing (NLP) techniques to study social media users with particular interest in political figures. Prior to pursuing her Ph.D., she actively participated in software competitions calling for innovative software solutions to solve global social problems e.g. Microsoft Imagine Cup, National Software Competition and etc. Broadly speaking, Feifei Zhang is interested in studying users’ behaviors, mining user-generated content and exploring patterns of social interaction in social media by using mixed research methods, including text mining, machine learning, content analysis, survey and interview. More specifically, her research focuses on how organizations use mediating technologies to interact with external stakeholders. She is interested in message flow and patterns of interaction between organizations and stakeholders in the social media context; effect of social media technology and design on facilitating and shaping communications between organizations and stakeholders; and how the interaction between operators, users, technology and content develops the culture of social media as well as how the culture of social media influences social media use. The communities she is currently focusing on are Facebook, Twitter, Youtube, Yelp, Sina Weibo and Wechat. Brian Dobreski is a Doctoral Student at the School of Information Studies at Syracuse University. He received his B.Mus. from Nazareth College, and his MSLIS from Syracuse University. Prior to returning to the School of Information Studies as a PhD student, Brian worked as a catalog librarian for Eastman School of Music and Syracuse University. He has also been an adjunct instructor for LIS courses since 2013. Mahboobeh (Mabi) Harandi is a PhD student in the School of Information Studies (iSchool) at Syracuse University. She got her MSc in information systems from Norwegian University of Science and Technology where she was involved in the SmartMedia program and specialized in machine learning techniques and sentiment analysis over news articles. She did her MSc thesis at iSchool in Syracuse University. Jerry is a doctoral candidate and 2012 graduate of the iSchool's Information Management Master's program. Jerry earned a Bachelor of Science degree in Business Administration with an Accounting concentration from Morehouse College in 2004. After finishing his undergraduate studies he spent five years working as a human resources information officer at JPMorgan Chase. In this role he prepared various compensation reports, analyses, tools, and training materials for a globally dispersed team of human resource professionals supporting senior managers in a 30,000+ employee business unit. Sam Jackson is a PhD candidate in the Social Science Doctoral Program in Syracuse University's Maxwell School of Citizenship and Public Affairs. He studies political extremism and political conflict in the U.S, focusing on extremist internet-based content. Olga is a social science doctoral student at the Maxwell School of Citizenship and Public Affairs. She came to Syracuse University as a Fulbright Fellow to study ways in which platform-mediated communities use social media to organize for political action and civil resilience. 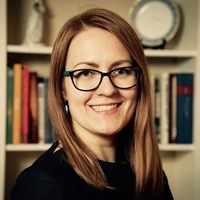 Specifically, Olga uses digital methods to explore how civil society actors engage with social media in the present-day context of eastern Ukraine. Prior to beginning graduate studies, Olga was involved in political campaigning and ran a center for public opinion research in her home country of Ukraine. She also served as a youth delegate of Ukraine to the United Nations.